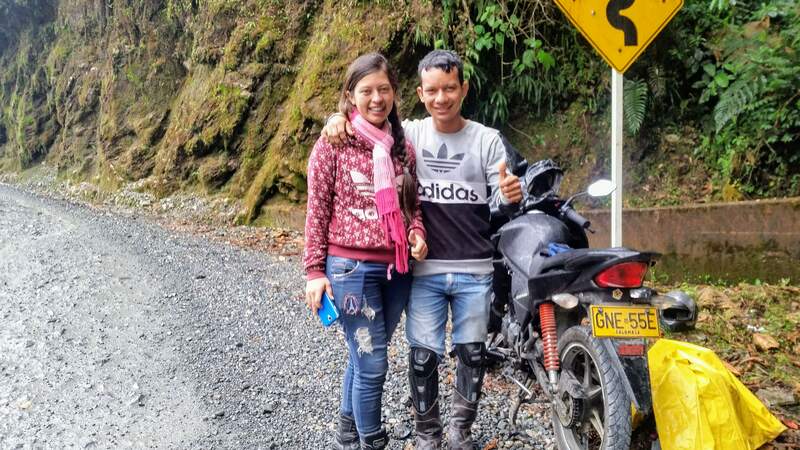 Our ultimate miles in Latin America present a myriad of tests, including a ride on a road called the Devil’s Trampoline. 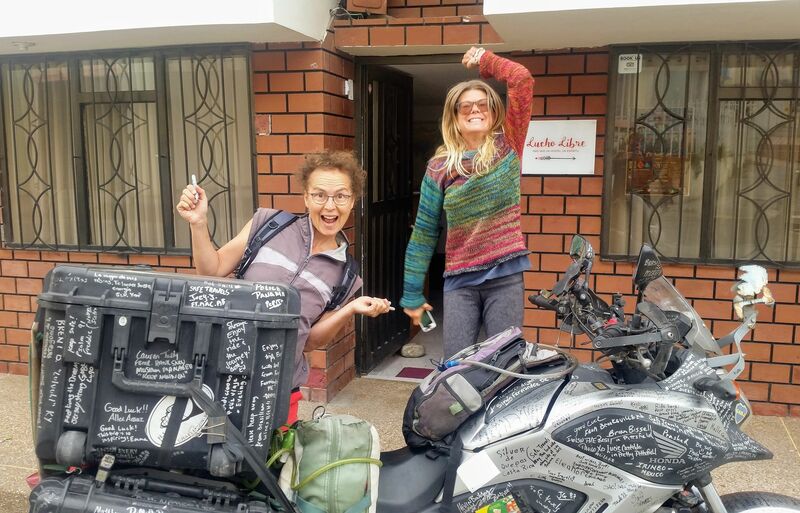 In this post, we head towards Bogota, Colombia, reaching the finish line of our Latin American adventure. Warning: This post is really media heavy. You might want to let it load for a minute before continuing. For those with a slow internet connection, I apologize. That doesn’t look too bad, does it? I was nervous about the time table since I knew I had a congested border to cross on my first day. 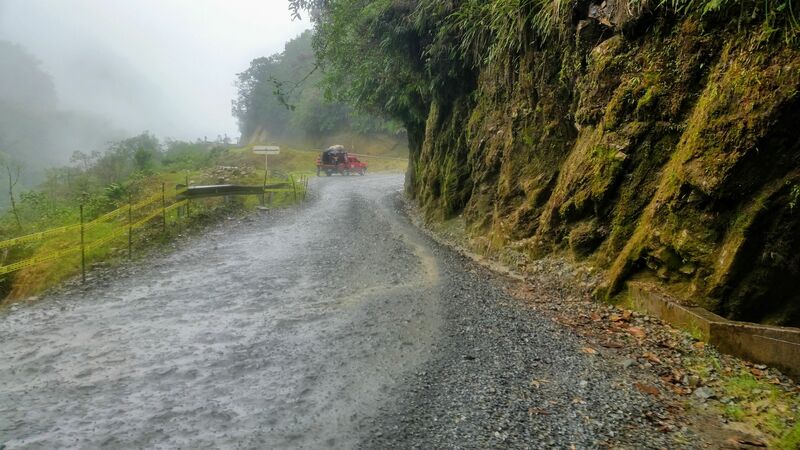 Additionally, these winding Colombian roads usually take more time to traverse than is indicated by Google Maps. I had a fairly early start to this day, saying a difficult goodbye to Rosita. 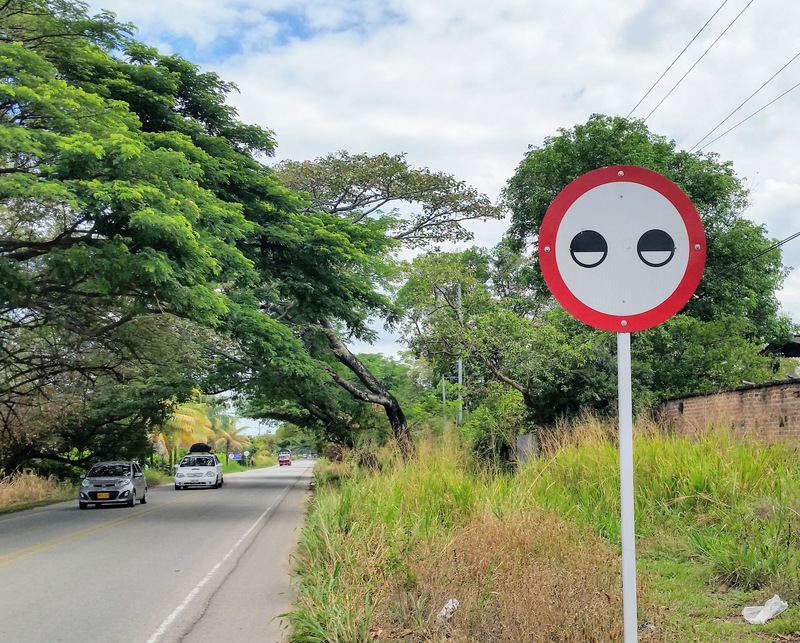 The sign pictured below is a common one all throughout Ecuador, though there are more of them nearer to the border. The sign reads: “When you buy, Ecuador first.” Ecuador uses the US dollar as their official currency. Because of recent strength in the dollar, it is usually much cheaper for Ecuadorians to make major purchases in the neighboring countries of Colombia and Peru. I guess these signs are meant as “guilt trips” for would-be international shoppers. This would be a day that once again brought to the crisis in Venezuela to the front of my mind. Though it is hard to pinpoint exact numbers, it is estimated that around 2.5 MILLION people have fled the country. That is more than the population of Nebraska. Many have no option but to travel on foot, carrying all of their worldly belongings. 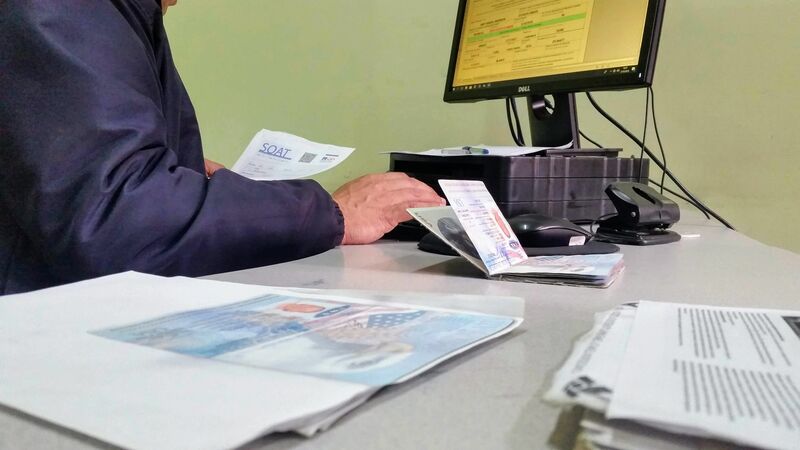 I purchased my mandatory insurance (about $25) for Colombia and continued to the Colombian offices. At first blush, it looked nearly as congested as my previous visit. There were some signs of improvement, including a UNICEF tent that had some games and toys for the kids. 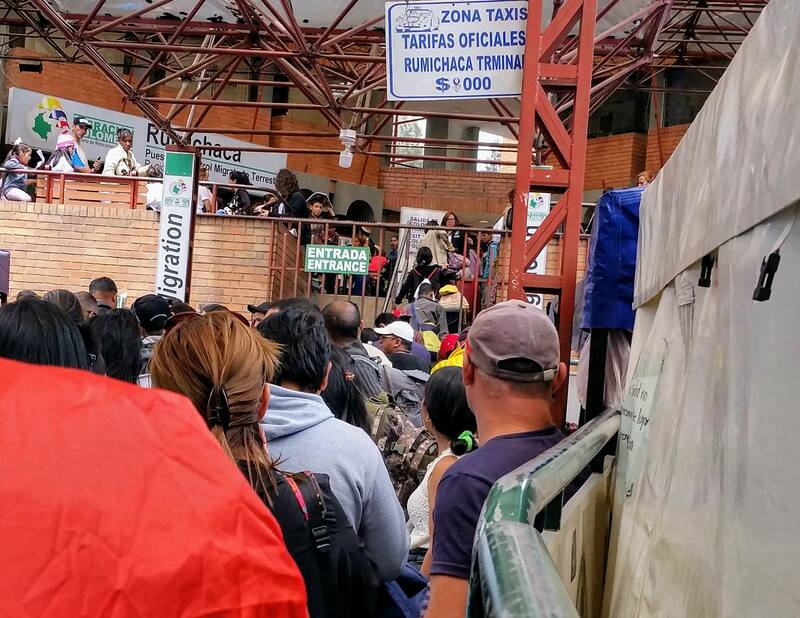 Additionally, the lines were now split into three queues: Columbians, Venezuelans and everyone else. Still, the line was painfully slow. It took about two hours for me to reach the front. Just as it was my turn to climb the stairs to the final lines, a barricade was hastily put in front of me. The guards began chattering and I couldn’t catch what they were saying. It slowly became clear that a politician was arriving with his whole entourage. Apparently, he needed to see the border mismanagement with his own eyes. I guess he’s not a faithful reader of this quality publication. I successfully restrained myself from shouting about the 2+ hour lunch break that all of the border workers take. Problem Solved. Once the politician’s posse had departed I was allowed to proceed up the stairs and was instructed to join a line with a bunch of Venezuelans. They were really friendly and I made lots of new friends, but they thought I was in the wrong line. Sure enough, when I finally completed the two-minute process of stamping my passport, the official asked me why I was in that line. I was able to keep myself from saying something snarky. Problem Solved. The customs office informed me that I needed to make a few more copies of my documents. I found a little shop for doing so and was back at the office within ten minutes. Unfortunately, all of the workers were now at a meeting. I sat as patiently as possible, waiting for them to return. Once my paperwork got started, the only issue I had was with Annie’s color. The official had apparently never heard of the color silver, instead describing Annie as gray. For some reason, this distinction felt important to me. I tried me best, saying, “Es como gris, pero mas brillante.” (“It’s like gray, buy more shiny.”) Eventually, I gave up and decided that it wasn’t worth the hassle. Problem Solved. Don’t worry, Annie, you’re always silver in my heart. I was now free to enter Colombia, but five hours of precious daylight had been consumed by the border. Though I knew I would have to ride a little while in darkness, I set sights for Pasto. There were further delays with construction and general traffic congestion. 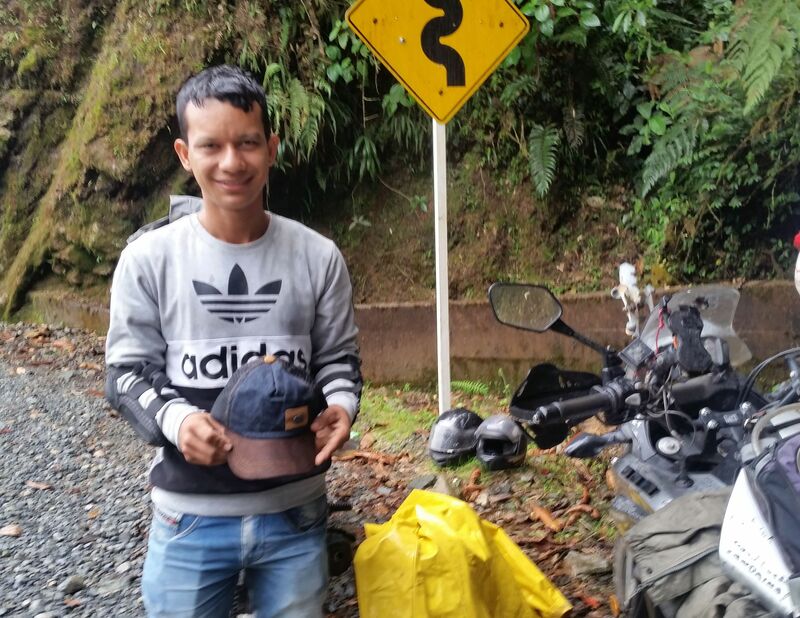 Thankfully, drivers in Colombia almost always leave an extra “motorcycle lane” open. 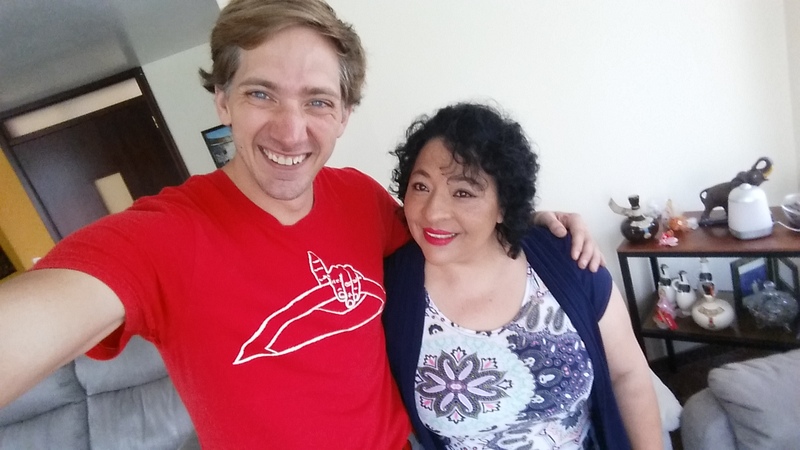 I kind of had forgotten how friendly Colombians are. Though probably not quite on the level of Brazil, I think they are solid runners-up in this category. I couldn’t even buy some eggs from the corner store without adding a facebook friend. Getting Annie out of the hostel proved to be a bit of a challenge. 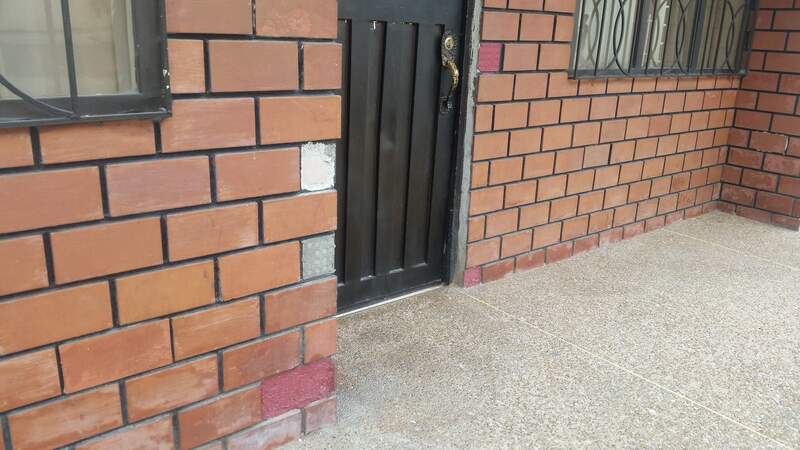 In doing so, I took off a couple of bricks around the entry way. 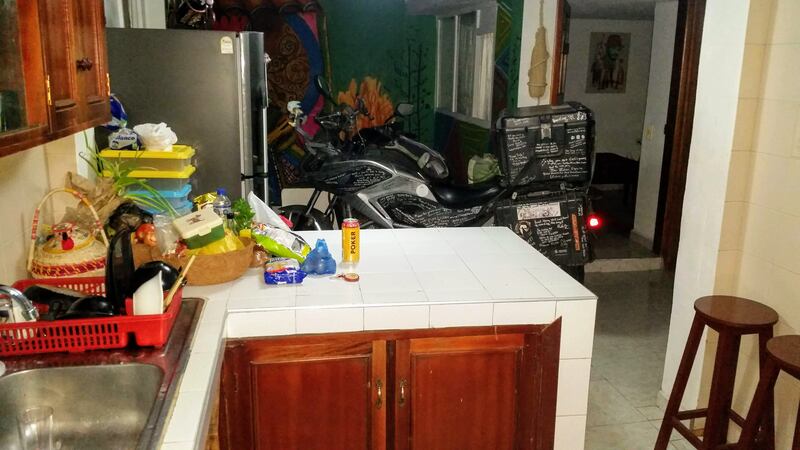 I think Annie will be the last motorcycle to park inside this hostel. Sorry about ruining it for everyone. I said goodbye to some new friends, got my first signature in Croatian and hit the road. Today would be no regular day. 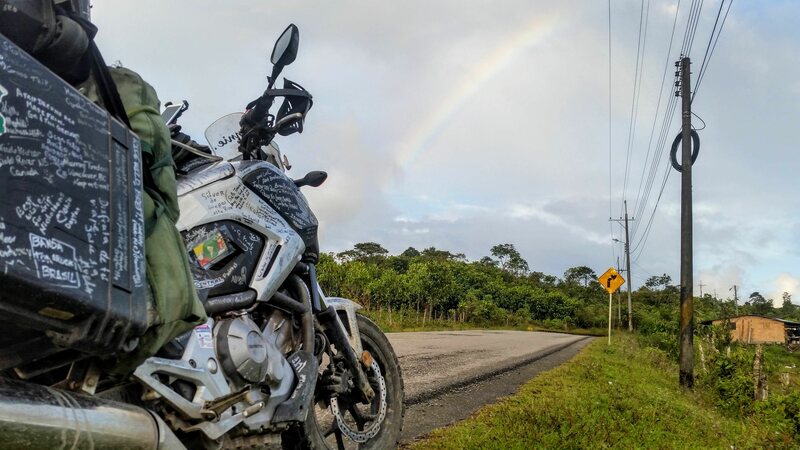 Today I would be tackling one of the most notable roads in South America. Colloquially, it is known as the “Trampolin del Diablo” (“Devil’s Trampoline”) or as “Adios Mi Vida” (“Goodbye My Life.”) Sounds like a great route to take when one is in a hurry, right? 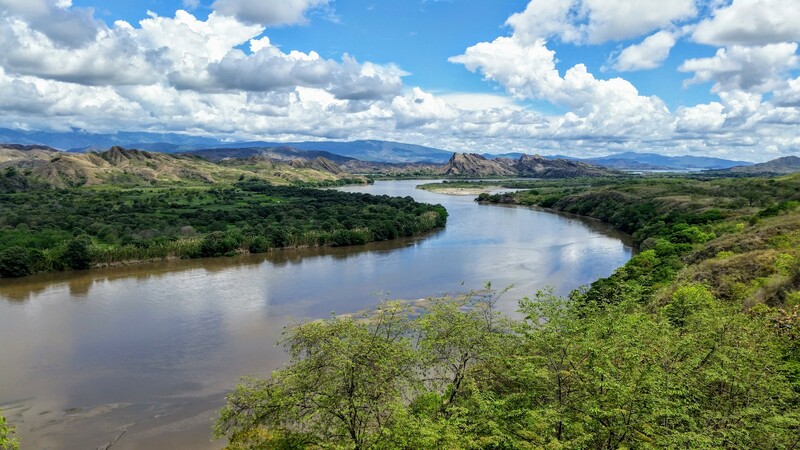 Most of the population of Colombia lives in the valleys between the mountains. 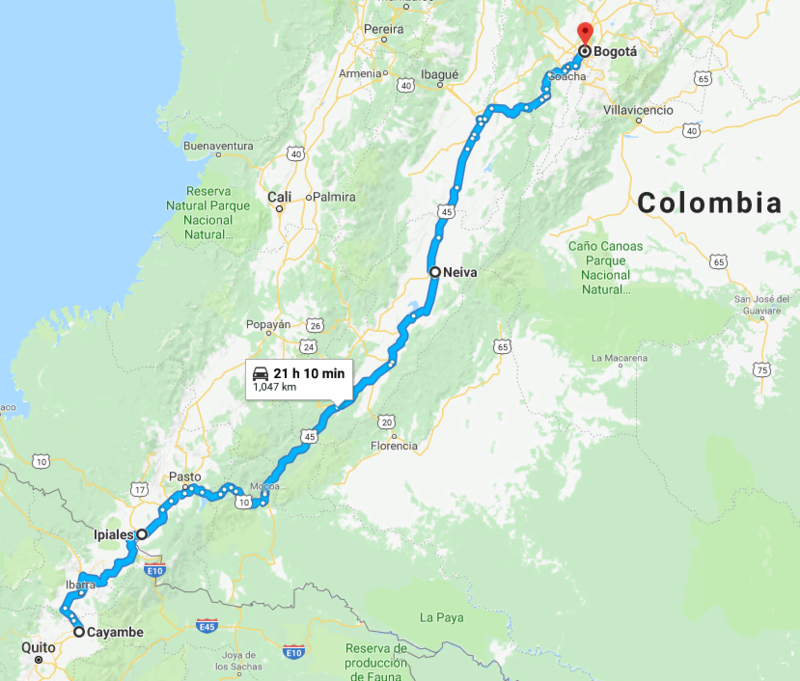 The Devil’s Trampoline is one of the roads which connects the western valley (home to Medellin, Cali and Pasto) to the eastern valley (Bogota, Neiva). I knew that this would be the most dangerous stretch remaining in Latin America. The opening stretch was absolutely fantastic. It was well paved and had glorious amount of curves. During this part, a couple waved me down whose car was stopped on the side of the road. I normally don’t stop in these instances (for safety reasons) but the wonderful road had put me in a good mood. I still don’t fully understand what they needed, but they siphoned some gas out of my tank using an old sock to clean something on their air intake. It didn’t take too long and I was glad I had stopped. Problem Solved. Eventually, the beautiful pavement gave way to ominous gravel. From this point on, the conditions on the road would get progressively worse, but the surroundings became progressively more scenic. I came around a bend an saw an absolute unit of a vehicle. Given its scale, I knew that it could only belong to one of two entities: 1) The US military. 2) German tourists. Upon glimpsing the license which displayed “D” for “Deutschland,” I knew it was the latter. This was how I met my new friends Norbert and Bettina. As Norbert snapped the photo above, I began to think: His long-lensed camera was probably the most intimidating weapon that I’ve had pointed between my eyes in all of Latin America. I’m very thankful for this. It’s a problem I never had to solve. The main challenge of this road seemed to be trying to watch for sheer drop offs while also taking in the beautiful scenery. At the apex of one of the curves, I had my next test. A couple on a Honda CB110 appeared to be broken down. Part of me wanted to keep going since I was already way behind schedule, but I knew I had to stop. This was how I met Jose and Paula. They had a puncture in their rear tire, but were still in pretty good spirits. I only carry tools to fix tubeless tires and I suspected this smaller bike used tires with tubes. I asked Jose (using all three Spanish words that I know for “tube”) what type his tires were. Perhaps he just wanted me to try what I could, so he said they were tubeless. After finding the puncture, I used the reaming tool to clean it out and put in a plug. When I rotated to the valve stem to fill the tire with my compressor, I noticed that the tire was definitely a tube type. (I should have checked this first…not sure what I was thinking) This meant that I had effectively just made the hole in their tire bigger. Just call me Helpy Helperton. There wasn’t much else I could do, but I didn’t really feel like I should leave them. There was no town nearby and no cell service, of course. Additionally, it had begun to rain fairly forcefully. We decided that trying to wave down a truck would be the best course of action. Many passed, just glaring slowly, before a truck-taxi finally stopped. Now let me say this: In my recent posts, I’ve maybe been a little critical with the Latin American methods of getting things done. However, one of the things that I’ve always appreciated about the people down here is the “I don’t know, let’s try” attitude. The driver of the truck taxi didn’t really have room for the bike, but they decided to try anyway. 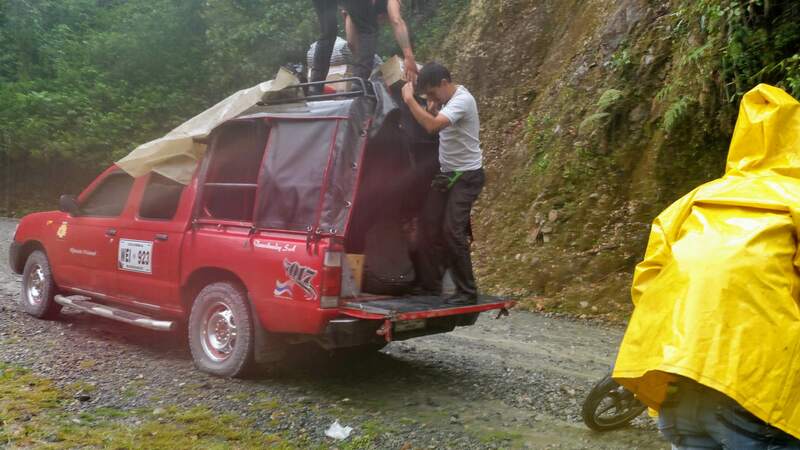 After some shuffling around of belongings, we hoisted the bike onto the tailgate. Jose was so appreciative of my help that he wanted to give me a hat. I accepted it graciously. I was really glad to see them get safely on their way. Despite being short on time, I’m really glad I stopped to help them. Though I didn’t actually do anything helpful, I think they were just glad to have someone around who could act like he knew what he was doing. Problem Solved. The road took on a new challenge as the rocks became slippery and the surface was washing away. Norbert and Bettina had overtaken me while I was doing my best AAA impression, so our paths crossed once more. Though this was a difficult ride, I never really felt in danger. I mostly just laughed at the conditions with a “is that the best you can do?” attitude. 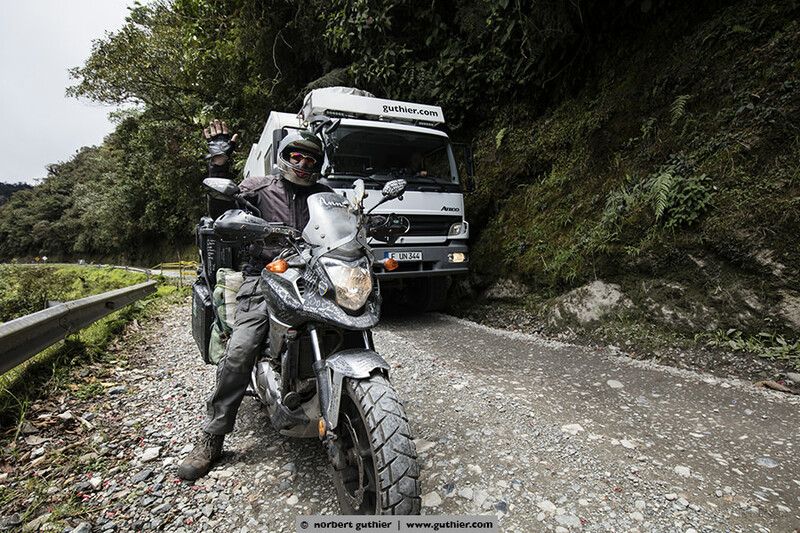 As far as deathly roads go, this one was nowhere as difficult as the one I faced in southern Peru (back in THIS POST). 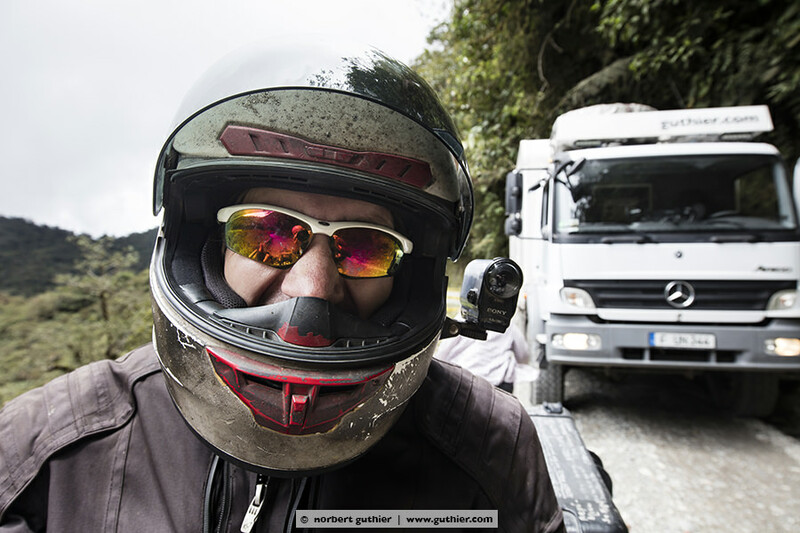 There were many more barriers and signs on the Devil’s Trampoline and the Colombian drivers are generally less aggressive than their Peruvian counterparts. 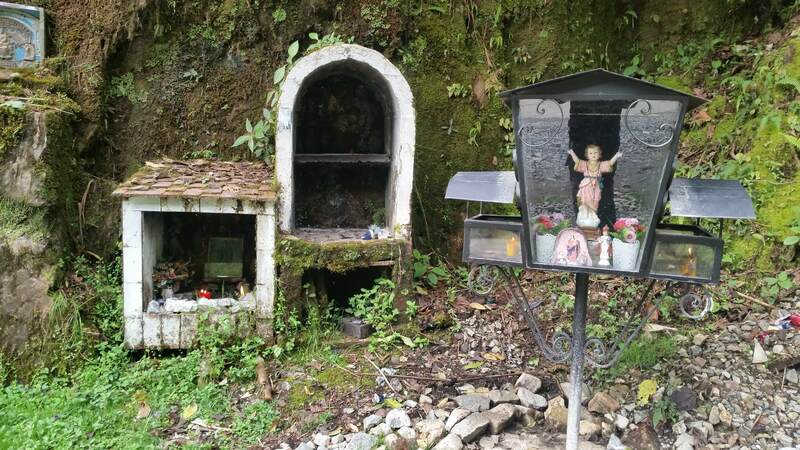 I reached the end of the Devil’s Trampoline, arriving in the town of Mocoa. There I was greeted with a nice rainbow. Our last stretch of treacherous road was complete. Problem Solved. I had dropped over 7,000 ft of elevation (2,200 m) from the highest point through the mountains and was now back in a more steamy jungle climate. The wild path through the mountains had caused another setback to my schedule. The sun set around 6pm, but I felt like I needed to log some more miles in order to reach Bogota the next day. In case you’re new here, you should know that I am very much against riding at night in Latin America. I pledged to myself that I would avoid it at all costs and I probably only rode 5-7 times at night during my nearly ten months south of the border. The reasons for this are many, including animals on the road, drunk(er) drivers and increased activity of shady groups of people. But perhaps the biggest reason to avoid nighttime riding is due to the decreased ability to read the surface of the road. The video below is a good example. If I had been carrying any sort of speed into this turn, the mixture of gravel and apparent meteor craters could have easily unseated me and landed me in the lane for oncoming traffic. On this night, I had been riding in darkness for about an hour when all of a sudden I clearly felt that I needed to stop. Call it a premonition, a spiritual intervention or just a gut feeling, but I decided to listen to it. Problem Avoided? I stopped in to a friendly gas station hotel that was just $8. Man…Colombia is kind of awesome, isn’t it? Cue the Chariots of Fire theme! I’m on my final leg in South America. 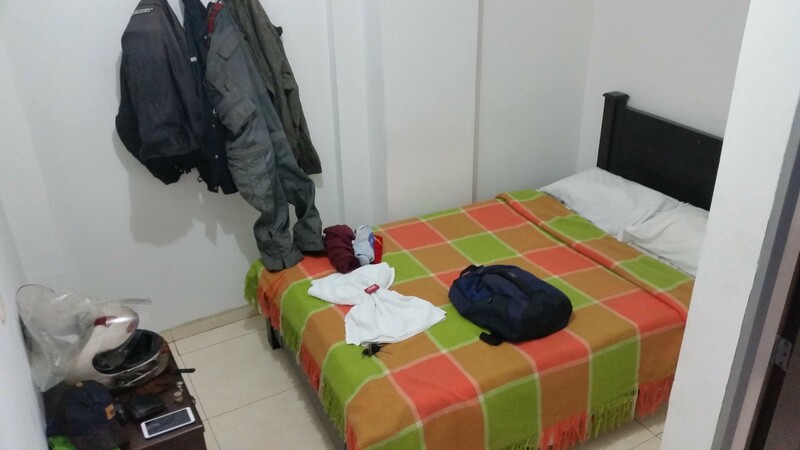 I had made just enough miles the previous day to make reaching Bogota realistic…if all went well. My shipping agent had said that I needed to begin the process the following morning. The day begin with some pretty heavy rain. 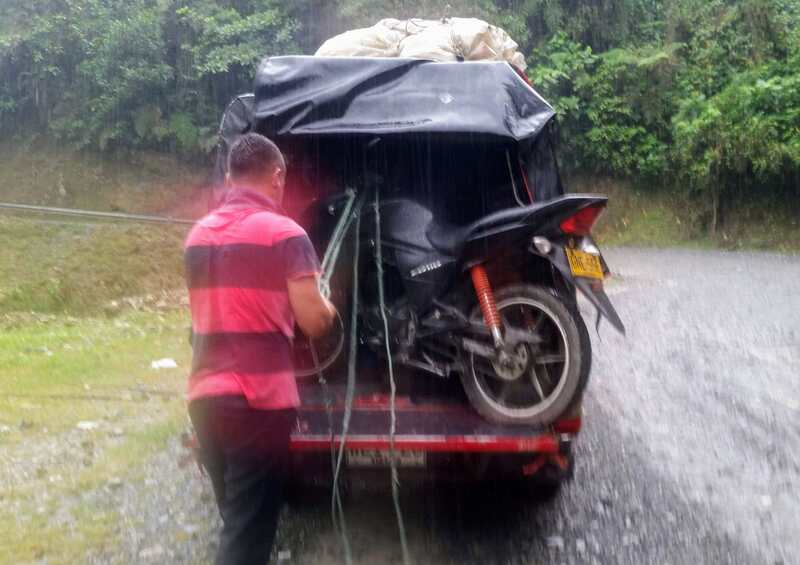 Motorcyclists in Colombia often don’t have another option for transportation in inclement weather. Accordingly, they almost all carry some sort of poncho. Shortly into my ride, I caught a “wide load” of a bike in my mirrors. 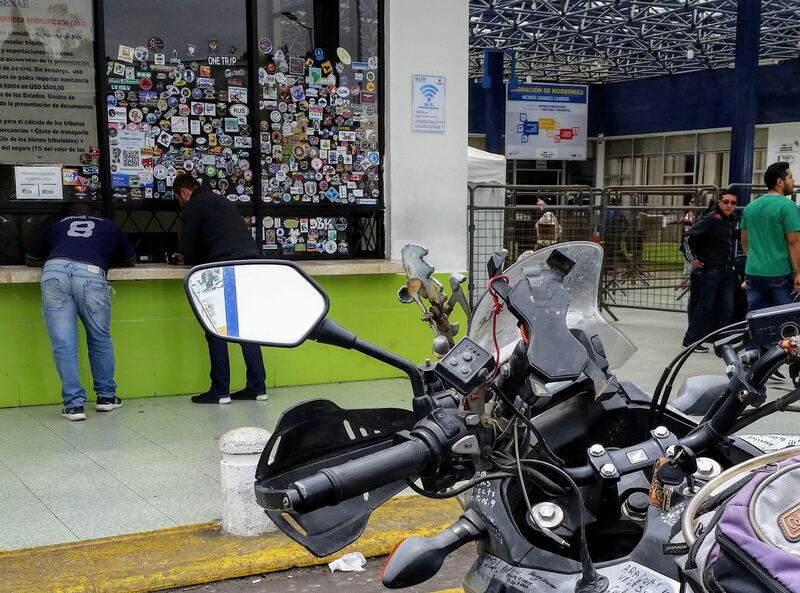 Probably the easiest way to spot a foreign bike in Latin America is the use of saddle bags. For some reason they are rare down here. 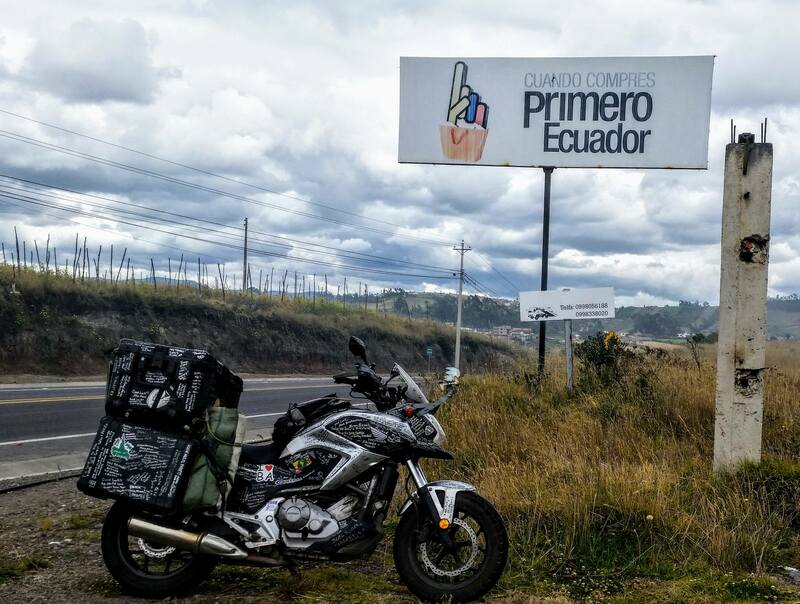 I slowed down through one of the towns and yelled a greeting to my compatriot on a KLR650. He responded in an American accent. Oh boy! This was how I met my new friend Jeff. 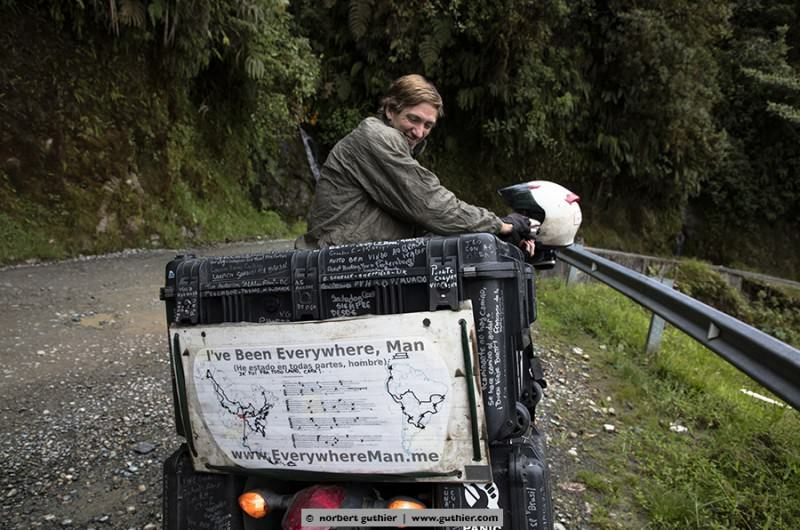 He was from Arizona/Colorado and has been incrementally travelling through Latin America for a number of years. He rides for a few months, then stores the bike and returns to it later. Unfortunately, we would get separated and I didn’t have as much time to talk to him as I would have liked. The video below is the only media I got of him. Ok. It’s time to see who knows their stuff. Can anybody tell me what the sign below means? The first correct answer will earn you a lifetime’s supply of high fives from me…and I’m a pretty good hi-fiver. The day was quite hot and I decided to do something that is out of the ordinary for me: Stop for lunch. The gals at this roadside restaurant seemed strangely interested in me. They said they had never seen a gringo before and all took turns taking selfies with me. Ahhh…the celebrity life. The rest of the day was delightfully uneventful and I made really good progress. On one road, I reached 70mph for the first time in a few weeks. 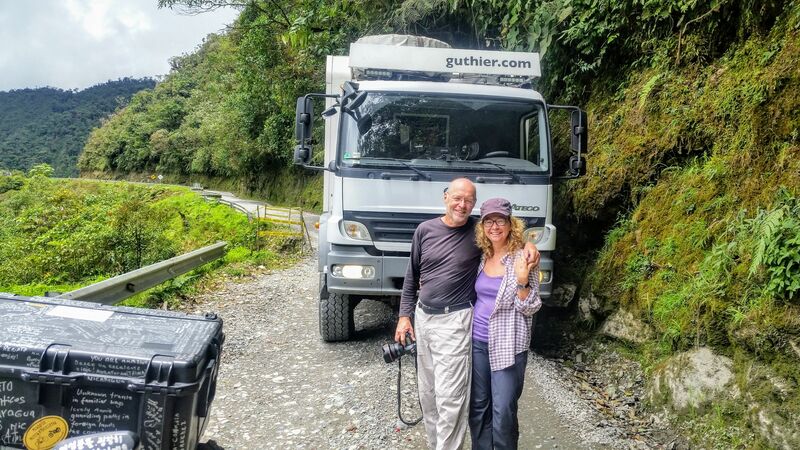 Reaching Bogota felt like an accomplishment, but I knew we weren’t quite out of the woods yet. One more shipping experience still awaited, which I doubted would be without incident. 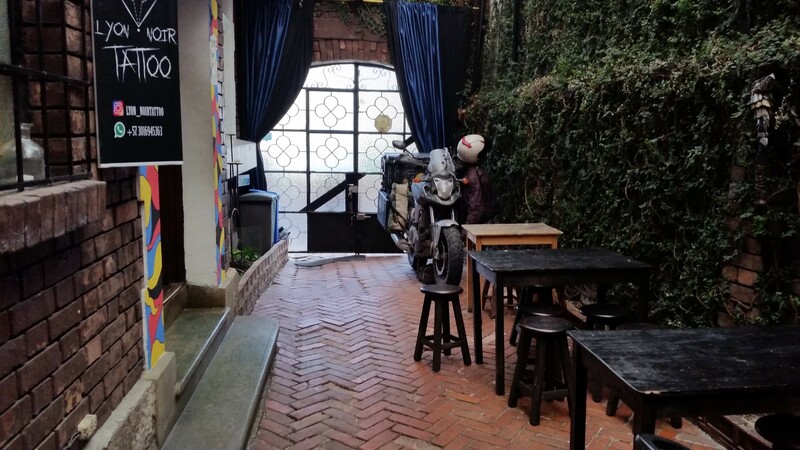 I weaved my way through the city traffic and made a home at a hostel called Casa 32. 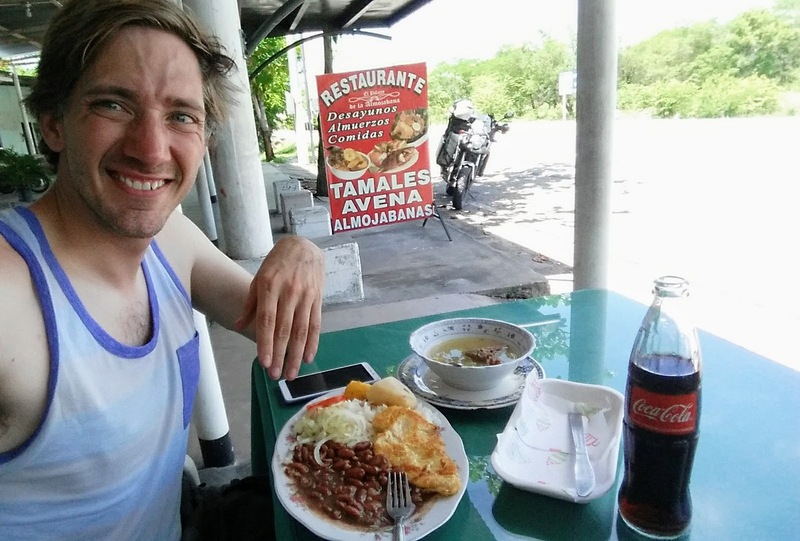 Survive 20,000+ miles in Latin America? Problem Solved. We’ll continue this final exam in the next post. Realtime update: I’m still in Nebraska preparing for my final loop. My “to do” list is still quite foreboding, but I’ll keep chipping away at it. It’s snowing in Lincoln today, so I know I need to get on the road ASAP. Could the sign say “Stop, if you are getting sleepy”? Grab yourself another pumpkin bar, Brett! (Or are they all gone?) Great job getting this post out so quickly. Again, I’m so thankful I didn’t know about that road before you were on it. Praising God for keeping you safe over and over. Thanks for working with him in being cautious. Proud of you for finishing the Latin America leg! It was so great to have you home for awhile! Missing you now! Love you, Mom! The sign is either a tired lollipop or telling you not to drive with your high beams on. I like the guardrails of rebar and caution tape. Holy cow! The sign is for – Low Beam Headlights Required. I hope to meet you in person some day. My darn job kept me from winning the high five prize for “SR-35 Low-beam headlights required”. Tomorrow I quit my job and follow this blog full time.